This New Zealand based customer’s core business is based around their quarry activities. They are a major supplier of quarried products to the construction industry, with raw materials extracted and processed from over 40 different sites around the country. This customer provides infrastructure materials for some of the country’s major motorways, bridges, reservoirs, to water and waste water treatment plants, with their product range focusing on the supply of hard rock and alluvial products. Our customer was experiencing problems under a cone crusher, with rocks of approximately 80mm diameter in size. They were having issues with rocks pouring out the side of the belt, once exiting the cone crusher and landing on the transfer belt below. The conveyor belt was “bowing” between the trough frames due to the material weight, therefore not allowing an even area for the skirt. The result was constant material spillage. This problem is caused by belt edge sag and it is usually caused when there are too few idlers installed at the loading point. The solution to this problem is to provide support under the chute using a slider bed. By doing this any belt edge sag will be eliminated and the effectiveness of the skirting seal will be increased, so reducing the spillage. The first step was to remove the existing impact rollers. 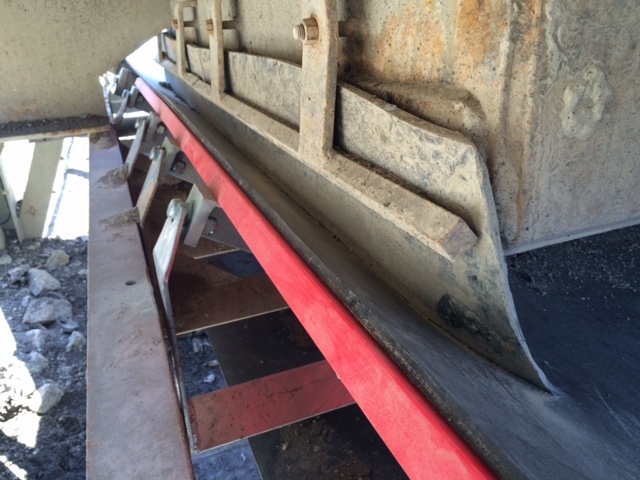 The K-Sure® Belt Support was then positioned under the transfer point and installed. A design feature of the K-Sure® Belt Support is that it can be retro-fitted, so the customer did not need to drill any holes, modify or fabricate any special parts. All items supplied were “off the shelf items.” The 2 man procedure took approximately 45 minutes to complete. The belt now runs 100% flat, allowing the skirting to sit smoothly on the conveyor belt and effectively contain the material load.